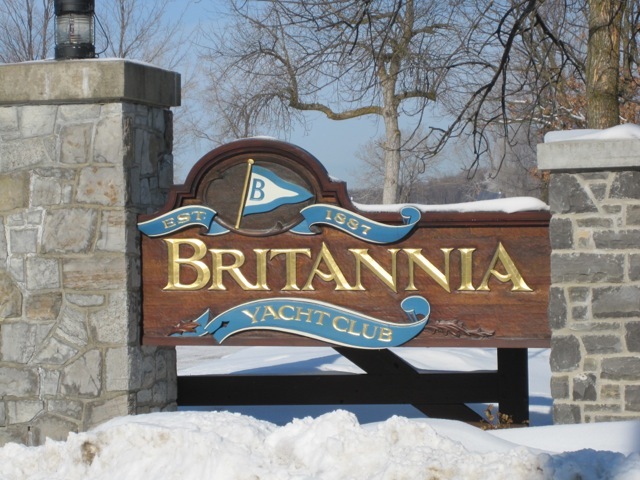 Located in Ottawa’s west end neighbourhood of Britannia Village, the Britannia Yacht Club (BYC) is one of Canada’s oldest yacht clubs. Its roots are based on a gathering of cottagers who spent summers at Britannia-on-the-Bay. Once known as the Britannia Aquatic Club, the association met for nine years in an old saw mill. The name changed several times over the years, and the club prospered, with many of its members winning national championships. A new clubhouse was constructed in 1907, however, it was destroyed by fire in 1918. Social activities of the club were subsequently moved to the old clubhouse, where they remain today. As paddling declined, BYC became a sailing club with a few motorboats. The Britannia Yacht Club has received a number of renovations over time, but has still remained its historical backbone. It offers 250 keelboat spaces in a well-protected harbour, in addition to dry sail facilities for dinghies and small keelboats. Secure inside storage is also available for sail boards, kayaks, and canoes. Several tennis courts are also located on the property. There are also several lounges available for the enjoyment of members, offering lunch and dinner in the Sunset Room overlooking Lac Deschenes. Clubhouse rooms can be booked for private functions. Interested in learning more about Brittania Village? Drop us a note or give us a call at (613) 238-2801.